The Society of the Cincinnati is an American military, patriotic, beneficent, social and non-political organization. It was formed at the close of the American Revolutionary War by commissioned officers of the Continental Army (not the militia). The struggle for American independence was already won by the spring of the year 1782 when the victorious veterans lay in their long huts among the hills beside the Hudson River, in the vicinity of New Windsor, N.Y. Here they awaited news of the adoption at Paris of the treaty of peace with Great Britain. The American militia had been called into service for the last time and were long since returned to their homes. The regular army, or Continental Line, as it was called, was about to be disbanded. Eight years of warfare were ended – the best years of the lives of many of the men and officers, and the most fateful. They were not unaware of what they had achieved in the world’s history. They knew that an empire was born, founded upon the newly awakened principles of liberty and equal opportunity under the law. It seemed fitting to the officers to resolve with each other, before they parted, to take steps to keep alive the ideals for which they had fought and suffered. 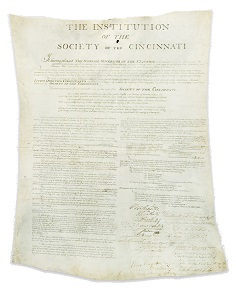 They banded themselves together into a fraternal fellowship under an agreement or compact which they styled the Institution of the Society of the Cincinnati. In this document the founders ordained that the Society should not perish with them but that it should be perpetuated by their first-born sons and their eldest male prosperity down through the ages that were to follow. Although limited in the number of its members, this oldest of American patriotic organizations has been closely associated with the making of the nation and has counted amongst its personnel, leaders in statesmanship, in military and naval life, in the judiciary and in diplomatic circles. Through generations of hereditary and honorary members, the Society of the Cincinnati has striven to perpetuate the friendships and the ideals of its founders but, as a body, has always kept aloof from political entanglements. Whatever influence the Society has had in the nation’s life has been exerted chiefly through the personality of its members who, from the first, have received inspiration from the examples and ideals of the founders and through the consciousness of their identity with the organization which was designated by these same founders as ONE SOCIETY OF FRIENDS. The Society, founded upon sentiment, lives today, a century and a half in its years of age and so it will live, so long as there is an American nation. Extracted from THE SOCIETY OF THE CINCINNATI 1783-1935, by William S. Thomas, MD. G.P. Putnam’s Sons, 1935.